Bees and flowers communicate using electrical fields, reveals a study from Bristol University, UK, published in the magazine Science. According to the article by the team led by Daniel Robert, communication flowers methods are at least as sophisticated as an advertising agency, using colors, patterns and smell to attract their pollinators. 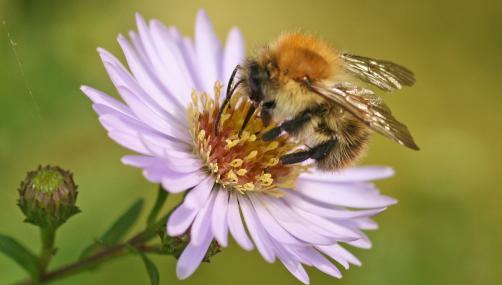 Now, scientists have found that these forms of communication joins another: the emission of electrical signals, like a neon sign, which allow the bees to distinguish them from other fields and find reserves of pollen and nectar. The researchers explain that the plants normally have a negative charge and emit weak electric fields. Bees, in turn, acquire a positive charge to 200 volts as flying in the air. Although there is no electric shock when a bee approaches a flower, a small electric field arises that potentially conveys information. Scientists do not yet know how the bees detect electric fields, but admit that their hair can react the same way that people's hair reacts to static electricity of an old TV screen. "This new communication channel reveals how flowers can potentially inform their pollinators on the true state of their reserves of nectar and pollen," said Heather Whitney, co-author of the study.